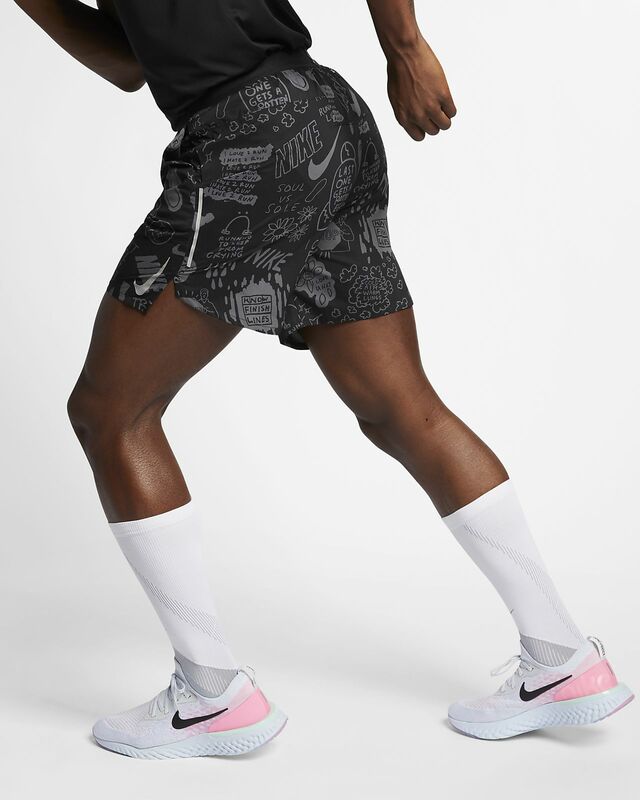 The Nike Flex Stride Nathan Bell Shorts are part of a collaboration with artist Nathan Bell, which celebrates running as a competition with yourself. They combine hand-drawn graphics with stretchy knit fabric that lets you move freely. STRETCH FOR MILES IN STYLE. Customisable drawcord can be worn internally or externally. Perforations at the back enhance ventilation. Low-profile elastic waistband lies flat against your skin. Zipped media pocket on the centre back holds your phone and has a vapour barrier to help guard items from sweat. Fabric: Body: 100% polyester. Waistband: 63% nylon/37% elastane. Pocket bags: 100% recycled polyester. Lining: 84% recycled polyester/16% elastane. Mesh lining: 89% polyester/11% elastane. When starting to work on the collection, Nathan Bell didn&apos;t consider himself a "runner". In order to get a more genuine experience, he started running. "I wanted to get out of my comfort zone and start running more. As I was running, I was literally saying in my head, &apos;I hate this. I hate this. I hate this&apos;". But the more Bell ran, he realised the appeal. "Running is more like a competition with yourself and with your mind". Bell then brought in his relationship with running as inspiration into the designs. "I just kind of dove in and had fun with it. I definitely worked my style and my sense of humour into the graphics". Have your say. 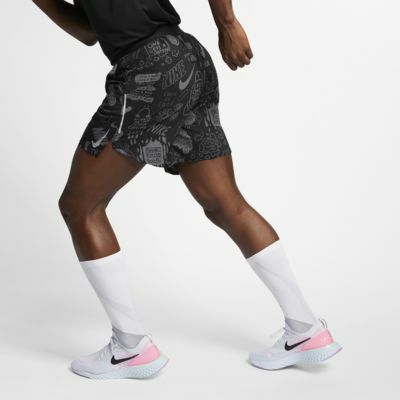 Be the first to review the Nike Flex Stride Nathan Bell.